“A relic,” I told him. I was only half joking. My boys love to pay for our groceries and they have a toy cash register that they play with all of the time, so they definitely understand that things cost money. It’s just that to them, money = a credit card. I always carry a small amount of cash with me just because there are a small number of places where cash is required. But 99.9% of the time my wife and I pay for things with a credit card. Now, credit cards are tricky. Credit card debt can be crippling because of the ridiculous interest rates, and credit card companies have all kinds of tricks they use to get you to spend more than you should so you have to pay those interest rates. Credit card companies WANT you to owe them money, and avoiding credit card debt should always be priority #1. But when they’re used right, credit cards offer a number of benefits you can’t find elsewhere. I use credit cards for all my spending. I also make sure to pay the entire balance in full and on time every single month. Here’s why I use them and how I avoid any mistakes that might get me into debt. I don’t have to carry large amounts of cash, worry about withdrawing from the ATM based on what I’m buying, or deal with coins (ick!). Tracking my spending is easy because all my credit card transactions are automatically tracked online. To be fair, a debit card would accomplish those same two goals. But it doesn’t have the next few advantages. Regularly using a credit card and paying it off on time every time helps me build a positive credit history and increase my credit score. This one drives me crazy: YOU DON’T NEED TO CARRY A BALANCE ON YOUR CREDIT CARD TO IMPROVE YOUR CREDIT SCORE. In fact, unless there are extenuating circumstances you should never carry a balance on your credit card, ever. The interest will destroy the potential benefits of the card. You SHOULD absolutely pay your bill in full and on time. This myth that you have to carry a balance is ridiculous and was probably made up by the credit card companies themselves. You also don’t need to spend a lot on your credit card to impact your credit score. All you need to do is make one purchase per month and then pay it back on time. I love earning points I can use for travel. These days we primarily use our points to travel from Florida to Boston to see my family. The points make it much easier and more affordable for us to keep that connection strong. I also use the points we earn to visit friends, go to weddings, and make the occasional business trip. I’ve easily saved thousands of dollars over the past few years traveling with points. Most credit cards offer extra protection in the form of extended warranties, insurance when you rent a car, and identity theft protection. These are the kinds of things that you almost never think about but are extremely helpful in the right situations. Of course, all those benefits would be moot if I got into debt. The interest I would have to pay would render the points, credit bump, and convenience completely meaningless. In other words, credit cards are only worthwhile IF you pay your balance in full and on time every single time. Here’s how I make sure that happens. The first thing I do any time I get a new credit card is set up auto pay. That is, I link my checking account to the credit card and set it up to automatically pay the entire balance on the due date every single month (this is set up through the card’s website). I get an email each month telling me the balance and the due date so I know what’s going on, but the actual payment is handled automatically. This makes sure I always pay on time and never carry a balance. Every week I log into mint.com to categorize the past week’s spending and saving. Every month I look at the last month’s spending, as well as our averages over the last 3, 6, and 12 months. This habit ensures that I’m always on top of our spending behavior and that even with our almost limitless access to credit, we’re living within our means. You can learn more about exactly how I do this here: How I Track My Spending. Quick note: There’s good research showing that people spend more money when they use credit cards than when they use cash. I’m not arrogant enough to think I’m different. I’m sure we would spend less if we used cash and I’m also sure that would be helpful. This system works well enough for me but I’m pointing this out because you may benefit from something different. We have both an emergency fund and irregular expense funds. All of that money is sitting in savings accounts just in case. Any month with especially high spending (like car repairs or a trip to the ER) is covered by these savings buffers. 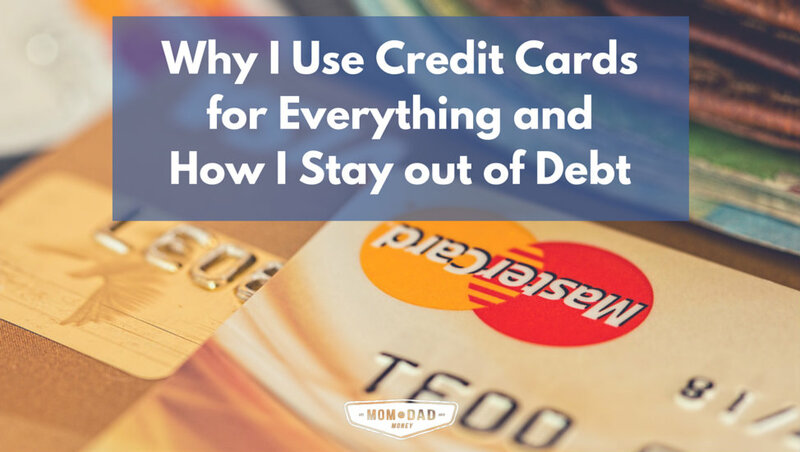 So even when our credit card balance runs higher than normal, we can handle it. Recently I’ve gotten more into something called travel hacking, which essentially involves opening new cards, using them for the sign-up bonus, and then moving on to the next one. I’ve written about it here and here, and if you really want to learn more you can check out Brad at richmondsavers.com. He’s a good guy and knows his stuff. Some of the best sign-up bonuses are for credit cards with annual fees. But in most cases the annual fee is waived for the first year with the assumption that they’ll get you the next year and every year after that. I hate fees. Other than a few rare instances where the sign-up bonus makes up for a 1st year fee that isn’t waived, there’s almost no reason to pay an annual fee for the right to use a credit card. So when I get a card that includes an annual fee, I immediately schedule a calendar reminder to call the credit card company in 11 months. When I call, my ultimate goal is to avoid the fee. But my secondary goal is to keep the card open or at least keep the credit available, since both the length of your credit history and your total amount of open credit impact your credit score. Tell them I love the card but I know there’s an annual fee coming up. Say that I’d like their help in waiving the fee. Sometimes (but usually not) they waive the fee. If so, great! I set another reminder to do this again in a year. If they can’t waive the fee I ask for the card to be converted to a version that doesn’t have an annual fee. This allows me to keep the card open, even if I’ll never use it again, which helps me build a longer credit history. If they can’t do that either, I ask them what happens to my points or miles if I close the card. Hopefully the answer is nothing. Then I ask them to transfer my credit limit from this card to another card I have with them (if I have another card with them). Finally, if they can’t waive the fee, can’t change it to a version without a fee, and my points and miles are safe, I ask them to close the card and mark it as “closed by request”. It’s not worth keeping the card open if there’s a fee involved. Search around and you’ll find a lot of people touting credit cards as the greatest thing ever invented, mostly because of the points (and because they make money if you click the link and buy the card they’re recommending). You’ll also find plenty of people who claim that credit cards are evil because they trick people into taking on crippling debt. The truth is somewhere in the middle. The benefits are nice, but they’re not even close to worth it if you end up in debt. This system has worked well for me. It’s offered me convenience, earned me points and miles, and built my credit history, all without ever having to pay even a penny in interest. But what about you? Do you use credit cards? If so, what’s your system? If not, how come? Let me know in the comments below! I do not have a credit card because I am afraid of the debt. As someone who has recently starting to live independently, I have been managing everything under a tight budget every month. So, to avoid the tricky interest fees or unnecessary debt, I have always kept myself away from credit card. But now, after reading your post, I feel bit confident now and I think I should have a credit card soon. And, I look forward to following your tips to avoid unnecessary debt. Thank you very much. I certainly hope it’s helpful. But like I wrote in the post, avoiding debt is definitely the #1 priority, so if avoiding credit cards altogether is the best way for you to do that then that’s the way to go. Good luck! We are reformed credit card users. Credit cards caused us to rack up over $100k in debt, because we were not disciplined with our behavior and use of them. For a time we cut all of our cards up. Now being consumer debt free, having a budget, and emergency fund we have returned to using credit cards. Like you we use them as a tool, paying them off in full each month and taking advantage of the rewards they have to offer. That’s awesome! Success stories like yours are always fun to hear. I appreciated hearing your approach and your strategy which this. We use credit cards for all of our spending like you do. Up until a couple years ago, I exclusively played the cash-back game. Now I push more toward travel-hacking for the better ROI but still keep a foot in the cashback game. I don’t carry balances (except where I get a year of zero interest and I put the balance into a 1% MyDirectSavings account for 11 months). I track all our cards and the annual fees on a spreadsheet. We have about 30-40 cards. I wait for the fee to post before I call the company because sometimes it’s been delayed in posting by up to 3 months, and they’ve always refunded it when I close the card. There are a couple cards I’ve found that are worth keeping with the fee, like the Marriott rewards card because an annual free night in a hotel could cost way more than the $75-85 annual fee. My wife tolerates this hobby of mine because it gets us nicer and more frequent hotel stays. I put small stickers (the white circular garage-sale ones) on her cards so she know which card to use for which type of transactions. It helps, especially with quarterly rotating categories. Nice! You’re definitely more active with your strategy than I am. I’ve been enjoying the benefits of travel hacking but have found it to be a little overwhelming as the number of cards increases and the easy opportunities are used up. Done right though it’s a big bonus for sure. What are your thoughts on balance transfers? I’ve got $20k of debt on one credit card with 10.49% interest rate. I’d love to transfer it to a credit card with no interest rate. I’ve only done this once before. Does this hurt my credit score? Good question Anna. A balance transfer can be a good move IF you’ve already addressed the underlying cause of the debt and are confident you won’t get back into debt. If that’s where you are, then it can save you a lot of money and allow you to get to debt-free sooner. But if you haven’t addressed the cause of your debt, then it’s more likely to cause problems than to help. Both because it opens up a new line of credit while freeing up your old line of credit, and because the 0% rate can make it feel like you’ve solved the problem before you really have. Also, no the balance transfer itself shouldn’t hurt your credit score beyond a potential small ding for the credit inquiry needed to apply for the card. This blog has tons of useful info and I’ve been implemting some of the steps you’ve outlined. 1) After you make a purchase do you wait for the statement to come in prior to paying off the credit card purchases? 2) How do you avoid lifestyle creep/overspending? I have a lot of student loan debt and do not have much/any experience with credit cards. I am wanting to build up my credit and think using this strategy would be a good way to go about that. I just want to make sure I am not playing with fire. 1. I wait for the statement to come in. I have auto-pay set up so that the entire statement amount is paid from my checking account on the due date no matter what. 2. I don’t avoid it perfectly, but the best tool I’ve found for this is You Need a Budget. My wife and I have been using it for almost a year now, and at this point I can’t really imagine going without it.